The Old Mill in Barton was the setting for the reunion of former Barton Grammar School pupils who sat their 'O' level examinations in 1963. Some 20 former classmates and teachers, some living locally and others from elsewhere in the UK and throughout the world, came together to share memories and experiences. Many had not met since leaving school, and for them it was the opportunity of a lifetime. 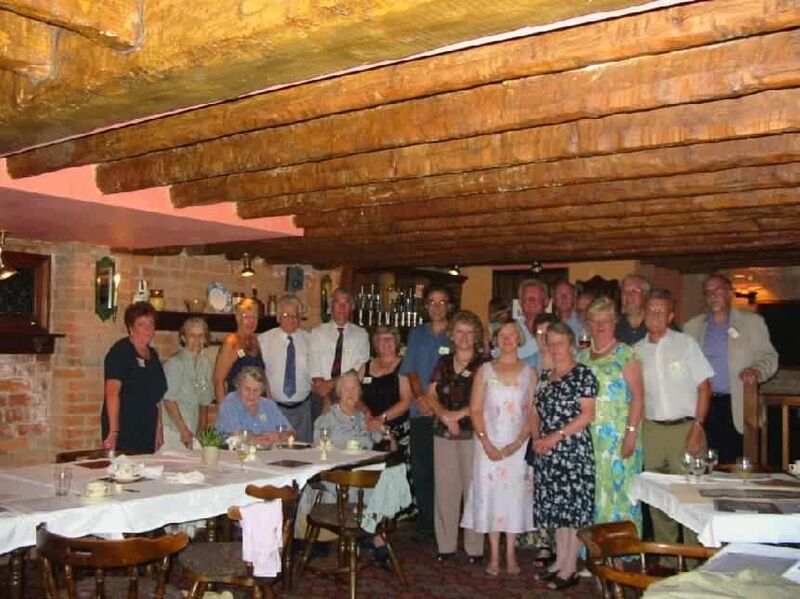 The reunion was organised by Margaret GOODHAND (née NEAVE) and Derek WRIGHT. After a similar reunion in Barton in 1990 to celebrate 25 years after 'A' levels, they had kept in touch and decided the time was right to reunite old friends. Although a number of former pupils couldn't be found in time and others were unable to attend, the organizers praised the Internet for the ease in developing and maintaining contacts. So will there be another reunion ? Margate GOODHAND and Derek WRIGHT say they would be happy to set up another meeting in 2004, if the demand is there. Anyone interested is invited to contact them by e-mail at mgoodhand@aol.com or at mdwright@wanadoo.fr. Joan ALLENBY (Mrs ARCHER), Cynthia ASHlEY (Mrs LYDEN), Doreen BARTON (Mrs DEANS), Joy BOOTH (Mrs KAY), Alan BREESE, John BROCKLESBY, Da vid GIBSON, Michael HARRISON, Valerie HARRISON (Mrs PHILLIPS), Mrs HODDINOTT (former school secretary), Margaret IRONMAN (Mrs RAITHBY), Gerald JACKSON, Muriel KIRMAN (Mrs CHEETHAM), Robert LYDEN, Margaret NEAVE (Mrs GOODHAND), Mrs ROBERTS (former teacher), Glenn STAMP, Kathleen THOMPSON (Mrs LOWE), Peter TOWLE and Derek WRIGHT.